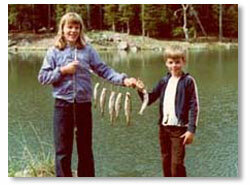 Lake County is home to many species of fish, the most common being the rainbow trout. Mountain and desert lakes are stocked yearly. Many lakes and reservoirs are open year round, but check with ODFW for restrictions. Weather conditions are a limiting factor in the winter for lake access. Several streams and lakes are home to the red-band trout, which is a protected species and these waterways are not open for fishing. This is by no means a comprehensive list and more information will be added on an ongoing basis. If you have information or pictures you would like to contribute, please contact Erika Lasater. 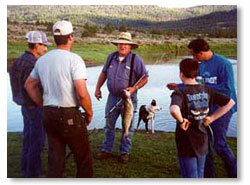 Thompson Reservoir is a popular lake for central Oregon fishermen. There are two campground facilities. Any size boat and motor may be accommodated. Trolling is a reliable method for catching fish. Fishing is best at the dam in the early spring. Techniques: Troll using fenders and worms, frisky fly, or brown rooster tail. Ana Reservoir is fed by underground springs, making it a popular lake in winter. Fish for the Hybrid Striped Bass early in the year along the west side of the lake. Rainbow and cutthroat trout are present anywhere around the lake. Although there are no formal campgrounds, camping is permitted around the lake perimeter. There is a boat ramp with no size or motor restrictions. Facilities are limited. 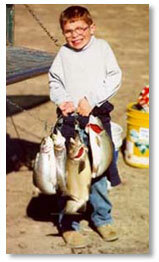 Average Size: Trout 14 - 21 inches, ODFW regulations on bass: 16 inches or bigger may be kept. Under 16 inches must be released. Techniques: Fly fishing is popular for trout. Shrimp, prawn, chicken liver, and worms are popular baits for bass. Campbell and Deadhorse Lakes, located about 40 miles north west of Lakeview near the Gearhart Wilderness area, are two favorite lakes during July, August, and September when the temperatures are high in the valley. Campbell and Deadhorse have public campgrounds with water and outhouse facilities. They are very popular and the best time to get a camping spot is during the week. Blue Lake is located in the Gearheart Wilderness Area and is accessible only by hiking. 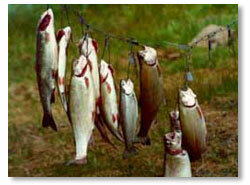 The lakes are stocked with catchable size rainbow and also have a small population of brook trout as well. Hiking trails around the lakes and to the Gearheart Wilderness Area are accessible from, or near the campgrounds. Because of their elevation, these lakes are not usually open until late May. Campbell Lake has especially clear water and is popular with float tubers in the mornings and evenings. Techniques: Shore access is limited. Power Bait, worms, or eggs usually work well from the bank. Rooster Tails, or Martin Panthers usually do well when trolling. The best response may be on a fly. Lofton, Holbrook Reservoir, and Little Hart Reservoir are located about 40 miles west of Lakeview on the Klamath Falls Hwy and are popular with locals. Lofton and Holbrook both have campgrounds at the lake, with Lofton having the best developed campground facilities. Half of Holbrook is located on private property. There is a day use area and limited camping space. All lakes have toilet facilities (outhouses). Lofton does have potable water. They can be accessed usually in April or May after the snow has melted, or before this if you can get by the snow. All lakes have boat ramps. Smaller boats can be used on the lakes, but motors are limited to electric trolling motors. The road is paved to Lofton, but not Holbrook or Little Hart. Trolling is good in all lakes. Fresh water shrimp in Heart Lake are plentiful and the fish here are well fed and can be hard to catch. It is worth the effort, however, as their meat is salmon pink and very tasty. In all three, large trout have been caught measuring over 20 inches. Techniques: Trolling or bank fishing using your "favorite fifty methods". They are popular for fly fishing. Drew's Res. is a popular recreational lake in the summer due to it's size (600 acres) and is located about 20 miles west of Lakeview. However, it is also well liked to those seeking a big cat fish or two. Much of the land surrounding Drew's Res. is private land and permission must be obtained from the landowners before trekking to the fishing holes on private property. Techniques: Bait from the bank. Dog Lake is a popular place year round. Camping and facilities are limited as is shore access. Boating is open to any size boat and gas motors. Bass, crappie, catfish, perch, and other panfish have a home in the lake. The cutthroat (red-band) trout here are protected. Bank fishing is limited to the north side of the lake. Techniques: Bass lures do well from a boat. Photo: Paul E. Denny. Cottonwood Res. about 1986. Cottonwood Res. is a popular summer recreation center - it is a great place to visit when the summer days are hot in the valley. There are two campgrounds, one for RV's and one for tents, two boat rams, but facilities are limited. There is a good-sized day use area. Most favorite trout baits or lures do well, but stay off of the bottom. This is a great place for kids to fish. Starting late August and during September, extra precautions should be taken to protect against yellow jackets. They can be extremely aggressive in this area at this time of year. Techniques: From the shore use nightcrawlers, Power Bait, eggs, or cheese. Troll using fenders and worms, Martin Panthers, or Rooster Tails. Most favorite trout lures/baits will do well here. Fly fishing is good here as well. Hart Lake and the Warner Valley Lakes house crappie, catfish, and trout. There are no developed campground areas here and not much shade; make sure to take plenty of water and sun block. Bathroom facilities have recently been added at the Warner Wetlands Day Use area. Boating or bank fishing in the shallow wetlands is permitted. Some of this area is a designated wetlands preservation area (Warner Wetlands) so you may want to take along that camera for some good shots of our feathered friends. Techniques: Mostly from the bank using jigs or bait, usually worms. Priday Resevoir conatains a healthy population of large rainbows and is said to have a number of crappies too. Although there is a boat ramp, day use area, and an outhouse, there are no camping facilities at Priday. Overall access to the lake is limited. Patience is a virtue at this lake. 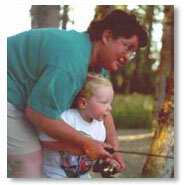 Vee Lake is a lake located partially on private property west of Plush and is a popular ice fishing lake. Access to this lake is tough over a jeep trail, so 4WD vehicles only are reccomended. Techniques: Ice Fishing with bait or worms. Photo: Paul E. Denny. Spaulding Res. Spaulding Reservoir. 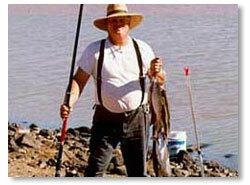 That some of the best fishing holes take the longest to get to is well known in Oregon's Outback. 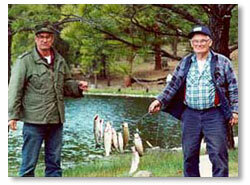 Spaulding, a diamond in the desert, is no exception but fishing here is well worth the two hour drive from Lakeview. 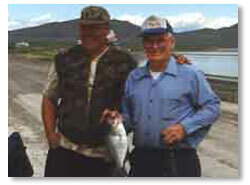 Access is limited only by road conditions and wind - a factor in fishing on any desert lake. Early mornings are usually the calmest. It can be ice fished in the winter. Although there are no facilities and no boat ramp, it is a great place to really rough it. There is plenty of room on the lake shore for tents and large sagebrush are plentiful. Nothing can compare to a starry night sky at this desert lake. For safety, it is best to let someone know where you will be and when you will be back. The two hour drive from Lakeview is worth it. Techniques: Usually from the bank with bait or flies. Reliable baits are Power Bait, worms, and cheese. Little Rock Reservoir is another lake worth the two hour drive from Lakeview. Access and accomodations here are limited. This is a little lake great for roughing it. It is also a popular ice fishing lake in cold weather. In the summer months, be aware that large rattlesnakes ranging between 1 and 4 feet are common here. Extra caution is needed. Note, July 2005: This lake is listed as "Big Rock" Reservoir on current maps, but I have always heard it called "Little Rock". According to local fisherman visiting the location earlier this spring, the reservoir is dry this year. Average Size: 14 inches, larger at the end of summer.